Immediate income- A conventional bridge can be made in a relatively short time and delivered to the patient within a couple of weeks. Therefore, the dentist can get paid for his services right away. On the other hand, dental implants require several months to heal before they are ready for the final crown, resulting in a longer treatment time. This period can become even longer if bone grafting is needed in conjunction with the implants. The dentist must now wait several months before they can charge for the crown placed on the implant. 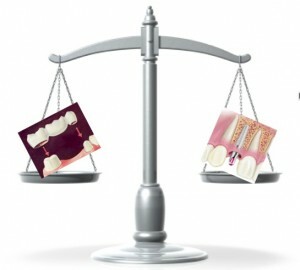 Therefore some dentists opt for the bridge in order to meet their daily production and collection. Yes, the immediate cash flow may be good for them, but not for the best interest of the patients. More income- A dentist charges about $4500* for a three-unit bridge. In contrast, with the dental implant option, the restorative dentist can only charge for one crown necessary to restore it. That is about $1800.They may opt for the bridge because they simply make more money than offering the implant option, even though it’s the right thing to do. Interestingly, the overall cost to the patient is actually less with a dental implant. Out-dated knowledge- A dentist once told me that he does not offer dental implants because they are only 80% successful! Just for the record, implants have over a 99% success rate when performed by skilled surgeons. Another dentist convinced patients to get dental bridges by telling them that implants get rejected often and involve a very painful surgery! The fact is, dental implants are 100% bio-compatible, do not get rejected, and have less pain associated with them than even a tooth extraction. Such lack of continuing education will lead to inappropriate recommendations. Lack of proficiency- Some dentists may simply lack the proficiency, knowledge, and skills required for implant dentistry. They feel more comfortable recommending a bridge because that’s just what they do. It is very surprising to learn that about 25% of dentists barely meet their continuing education requirements for licensure. They simply do not get the knowledge that they need. Patients need to do their due diligence and ask the right questions when choosing a dentist. Insurance coverage- Most dental insurances provide some benefits for conventional crowns and bridges, but not for dental implants. Driven by insurance benefits, your dentist may lean towards a bridge option to maximize insurance payments. Inadequate space for dental implant- This is actually a legitimate reason for a conventional bridge. If the space for the missing tooth is too narrow, a dental implant may simply not be an option. In most patients, the narrow space is caused by shifting of adjacent teeth into the area of the missing tooth. It’s important to know that orthodontic treatment can widen the space and allow placement of a dental implant. This way the bridge can be avoided. Yes, it is an additional treatment, but it is well worth the time and effort. This entry was posted in Dental Implants and tagged difference between bridge and implant, which is better. dental implant or bridge, why dental implants, why do dental bridge. Bookmark the permalink.